Via the informative and entertaining Life Two website, I came across this thoughtful essay by a woman who looked in the mirror one day and saw her mother’s face. Or not exactly her mother’s face, since they don’t look anything alike, but the contours of a face that is aging and thus evokes all that is her mother. I don’t look anything like my mother either. But as the years pass, I’m struck by the ways in which I’ve come to embrace a variety of behaviors that I once not only deplored in her – but fled in horror. Surely, this must be a telltale sign of adulthood. So, without further ado: Five Signs You’ve Turned Into Your Mother. 1. I carry a large library book wherever I go. No, not a magazine, newspaper or something otherwise easily folded. But a large – often hard-cover – heavy and cumbersome tome. And, like my mother, I invariably carry this book in some sort of cloth tote bag obtained from a public radio fundraiser or local bookstore that has since gone out of business. 2. I do back exercises. When I was a kid, it seemed like my mother was forever lying on the bedroom floor “wogging” her back. Used to think that was nuts. Now I do it all the time. And enjoy it. 3. I shop at vintage stores. Oh! How this used to mortify me when she shopped at second-hand stores. They all seemed so down-market with their crowded racks and musty smells. Now, those are the only places I shop, even for funerals. 4. I re-use things. I could always spot a package from my mother a mile off when I was younger. It would arrive in a manila envelope with these giant black magic marker pen strokes all over it where the original address had been crossed out and replaced with my own. Yup, I’m doing that now too. She also re-used tea bags. Tick that box as well. 5. I make lists. My mother is a compulsive list-maker: groceries, errands, phone calls, you name it. I do this too. But I’ve taken it one obsessive-compulsive step further. I announce my lists. As in “Now, I’m going upstairs…then I’m going to get dressed…then I’ll take out the re-cycling.” My husband really enjoys this. Not. With that sixth sense people develop when they’ve been in a relationship for a long time, he often just admonishes “No Announcements” when I get up from the table, before I’ve even opened my mouth. Now it’s your turn. What are the things you swore you’d never emulate in your mother (or father) that you now find yourself doing? My sister sent me this fabulous link today. I won’t say anything more about it, other than to encourage you to stick with it. It’s well worth it, especially for those – like me – with a weakness for musical theatre. 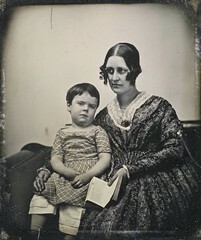 Image: Unidentified Mother and Child via Flickr under a Creative Commons License. What is ‘wogging’ your back? Is this a good thing? My mom was a great cook and she could sew like anything. I’m finding more and more that I like to cook and experiment in the kitchen, though I don’t make the same things she did (we don’t fry much at all). I can’t make clothes (yet) like she did, but I am really drawn to hand sewing and crafts like she was (she’s been gone 20 years now). I catch myself using the same mannerisms she did when removing glasses to see closer and how I thread needles and such. somewhere between “walk” and “jog” I’d imagine!